Using up some of my River Rock cardstock and I think it pairs nicely with the Garden Green. 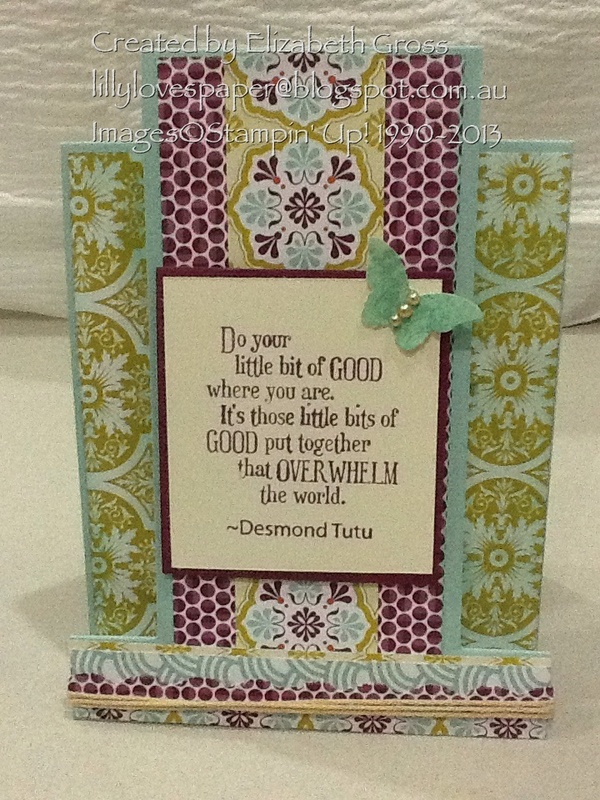 I love the Lattice Die and have finally purchased it so have been playing with different layouts. The First Edition DSP is cut as a single piece to sit behind and i have punched 2 circles with the Small Scallop Punch from Raspberry Ripple. I distressed the circles with my bone folder until the cardstock separated and then layered them back together and scrunched them up for some depth. They are stitched with some linen thread and a small flower button extra small flowers punched out with a retired flower trio punch. The Little Leaves sizzlit was used, and the Apothecary Framelits for the Green label. The Thankyou is also a retired stampset. different view, not the best photograph sorry! The card for class this week for Mother's Day, Pretty in Pink sponged over White Embossing Powder. a Wedding card using Hello Doily stamped in Clear Embossing Powder on Baja Breeze Cardstock, sponged with Midnight Muse ink and layered over First Edition DSP. Soft Floral Trim roses and Little Leaves Sizzlits in Garden Green. There is also a Baja Breeze border using the lace trim punch(retired). The Mr & Mrs stamp is in Midnight Muse and is then inked with the Champagne Glimmer Mist. I have always loved tiled patterns and these 2 Z fold cards make the most of the gorgeous Print Poetry Designer Series Stack (#129312 on page 16 of the Summer Mini). The inspiration for these cards came a card I saw on Pinterest (terrible time waster!, but oh so good). Barbara at barbarascraftcircle.blogspot.com has a tiled card in the Midnight Muse. Mine are similar but I have done a 4x4 version and stepped them up a bit with some added details. Any small punch would work just as well and I would love to try one with a heart punch and also one with circles. The third folded card is an Easel and I can't find where i got the original measurements for this. I have an earlier version with Sale a Bration DSP also. Pool Party keeps it nice and fresh . The cardstock is 10.5cm wide x 29cm long. Cards with folds are always interesting and in my latest class we made 4 different varieties. I don't know the correct names for them all but it was fun. Earlier posts show the trifold card I made for Easter ( one with Summer Silhouettes, the other with Established Elegance sets) , and this one is a bright fresh colour combo with Island Indigo and Lucky Limeade and the Best of Everything Set. I used the same measurements as before and instructions are on that page. This one has a completely different look - it's amazing how changing colours and stamping images can completely transform a card's look. The card base is a strip of Calypso Coral 10.5 cm by 28cm, scored at 14cm for standard centre fold. There is only one other score line. With the card closed and the spine on the left it is a mountain fold from the base of the spine ( ie bottom left corner) to the top right corner of the card front. Anchor inside is 3 layers with stampin dimensionals between . To attach the stamped and matted card front I put glue onto the lower triangle of Calyspo Coral and then put the wasabi mat down on the glue, this stops me from getting confused and glueing it in the wrong spot.... ask me how I know this!! The position of the anchor is up to you, but it is a card that doesn't allow too much room for writing any text so some experimenting is necessary. It may also need instructions on how to stand it up for some recipients!!! Hope that helps you have a go at this very easy card. Score on the card front goes from bottom left corner to top right corner. Anchor on the inside is 3 layers, green circle with 13/8"punch, mini scallop (11/4" I think) and stamp set from Christmas mini 2012 up on dimensional, and centre 3/4" circle punch also up on dimensional.